Thorpe St Andrew is pleasant Norwich suburbia beside the river. 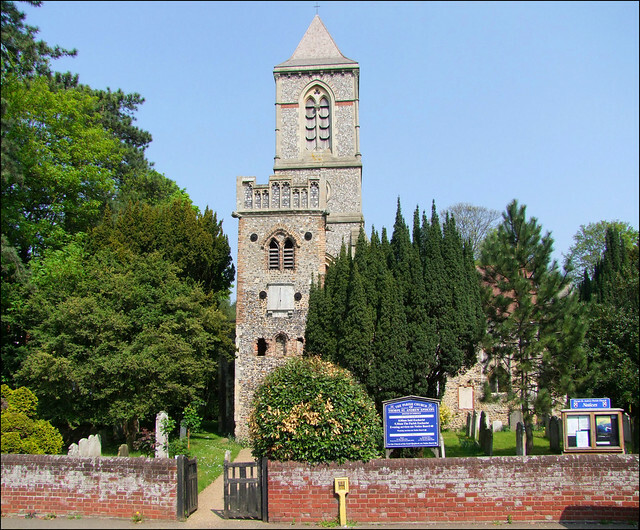 It still has a sense of being a place apart, which belies the fact that this church is barely twenty minutes brisk walk from Norwich railway station. The formal name of the Anglican parish is Thorpe Episcopi, and in older books you often find it refered to as Thorpe-by-Norwich. They are all the same place, although Thorpe Hamlet, around the railway station, is not: that is within the city boundaries, while Thorpe St Andrew is in the Broadland District Council area. St Andrew will be a familiar sight to those entering Norwich from Great Yarmouth by the old road, and, indeed, by the river. The most striking thing about it is that it has two towers, one ruined and medieval, the other grand and Victorian. before 1944 it was even more striking, because the Victorian tower was surmounted by a 150ft spire, making it a counterpoint to the Cathedral. The blitz made it unsafe, and it was taken down, to be relaced by a not wholly successful broach cap. By the time of the 1851 census, Thorpe had a population of well over a thousand people, and the tiny parish church was quite inadequate. To replace it, a huge urban church was built in the 1860s behind it to the designs of that most quirky of 19th Century architects Thomas Jekyll, whose contemporary Holt Methodist Church makes an interesting comparison. The new St Andrew was squeezed into the northern side of the graveyard, making full use of the available space. The great tower forms the south porch beneath it, and many of the wall memorials from the old church were reset below the tower, including several to the Harvey family, and a fine example of the Coade Stone memorials popular in the early part of the 19th Century, to the Rector's daughter Ruth Martineau. The font from the old church was moved into the new, and then in the 1880s the old St Andrew was ruinated, making a picturesque feature in the churchyard. The old tower was retained as a walkway through to the new church, which it remains as to this day. When I first started exploring Norfolk churches about ten years ago this church was a bit of a fortress, but nowadays it is open every day in daylight hours. And daylight you will need, because Jekyll designed a huge, shadowy temple perfectly suited to Anglo-catholic worship. This is a quirky building, to say the least, as you will detect straight away from the huge, blockish arcade separating off the south ailse from the nave, with its vast capitals suromounted by angels. The most striking feature as you enter and turn to the east is the rood screen. It was apparently installed in the 1920s as a war memorial, although it looks fully the work of the pre-War era, and the extraordinary figures painted on it are reminiscent of those featured on the reredos a short distance away at St Lawrence. They comprise a set of Victorian and Edwardian worthies, including Bishops, nobles, civic notables and a figure described by Mortlock as 'an anonymous American actress'! Arthur Mee named some of them as Lord Leighton, Lord Salisbury, Bishop King of Lincoln, General Booth, local Quaker Mr Birkbeck, Canon Liddon and Admiral de Ruyter. The south aisle is filled with a fascinating range of 19th and 20th Century glass; there is no north aisle, and the windows on the north side are clear. The east end of the south aisle is filled with the organ, and instead of the boxy chancels so typical of the decade, Jekyll designed a delicious octagonal apse, with narrow lancets to light it with colour from images of Saints. The glass is, for me, the best feature of this church. It is uniformly good. The most interesting is a memorial window to William Birkbeck who died in 1916. It depicts, in twin roundels, Christchurch College Oxford and the Moscow Kremlin, as a reminder of the work Birkbeck did to establish relations between the Church of England and the Russian Orthodox Church. Dennis King's Bethany scene further west in the same aisle is good, but best of all is his great 1969 west window depicting the symbols of the Apostles, perhaps the best 20th century window of its kind in Norfolk. We came here in Holy Week 2011, and I was pleased to find that St Andrew keeps fully the tradition of veiling images in Lent, unlike some more famously Anglo-Catholic churches elsewhere in the county. Of course, this meant that it was not possible to photograph everything, but it makes a good excuse to go back. Outside in the porch is the parish war memorial, and then you step outside into what is a most attractive churchyard, what with the ruin, and the dovecote, and the river beyond. The churchyard has a surprisingly large number of good 18th and early 19th century headstones. The reliefs depict drooping branches, weeping women, and one with an alarming number of masonic symbols. Well worth an explore.